Sorry, registration is not available in your country. We've sent you an email with instructions on how to reset your password. Haven't received anything? please contact support@slotsbaby.com for assistance. Please wait while we register your account. Here's a superb new online slots game from Swedish Developers Elk Studios that you can play. There's nothing more exhilarating than cheering your favourite football team on when their striker is about to score a goal. But what's even more exhilarating is the sound of a traditional chant and the thrill of winning an online slot game embedded in the thriving world of football. 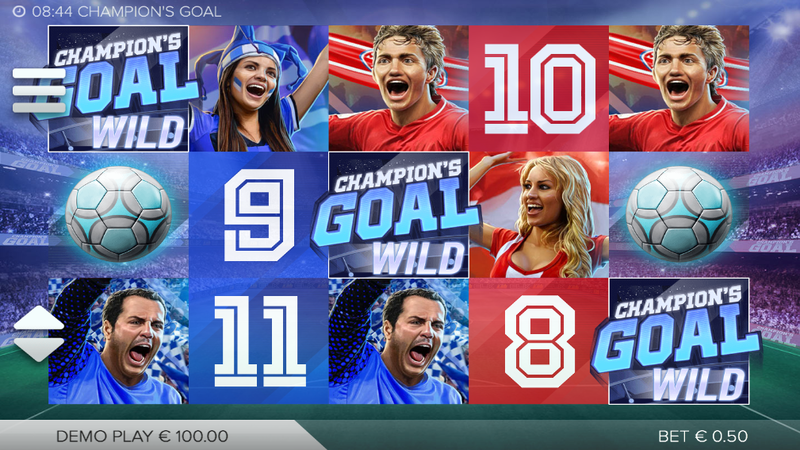 A football-themed online slot game like Champion's Goal. Created by the renowned developers of Elk Studios, the brand has managed to get all online casino and sports fanatic putting down their bets and winning prizes again and again. Champion's Goal is a recent online slot games that can be played on any device. PCs, laptops, tablets, smartphones, you name it. Interested to know how Champion's Goal as made it onto the list of the top favourite online slot games on the internet? Let's hear a bit more about Elk Studios. Don't let Swedish gaming software developer fool you with its young years. Established since 2012, Elk Studios has already made a name of itself in the lively world of casino online gaming. Creating other sharp, graphic-heavy games such as Electric Same, Taco Brothers, and The Lab aided the developer to mark its place in the gaming ranks. But it's the unique features that are included in their games, like betting strategies and game on, which made some of the world's most prolific online casinos notice the great potential that Elk Studio possesses. The players are able to see that great potential and uniqueness in one of the developer's most popular games to date, Champion's Goal. 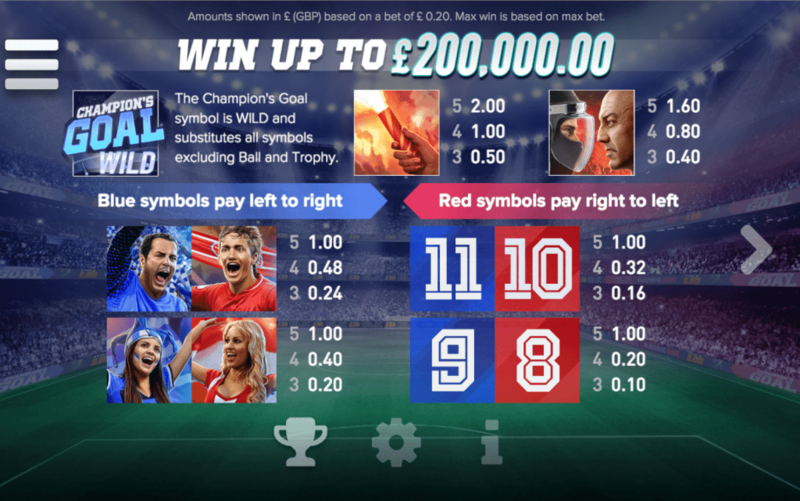 Champion's Goal is made up of 5 reels and 20 pay lines, and you have two teams: red and blue. As you would think, the blue team scores from right to left, and the red team scores from left to right. Plus, they all have the numbers 8-11 on them, which are worth up to 500 coins when the players receive 3-5 matching symbols on the game board. Like with any other slot games, you have your variety of WILDS and SCATTERS that can unlock bonus features when it comes to Champion's Goal. Champion's Goal WILD: These symbols replace all of the others except for the Trophy SCATTERS. Trophy SCATTERS: With every 1 of these symbols that appear on your reels, the players get 1 free spin. Derby Free Spins Bonus: This is activated when a free kick is granted. Cascading Tifo Bonus: When the reels are completely covered with a full match of symbols, this bonus is awarded until the clock reaches the full 90 minutes. The players get the visceral feel of an authentic football match when they hear the crowd cheer in the background. As part of the BONUS FEATURES and that visceral element, you can get instant prizes when spotting die-hard fans star players, camera-men, and other prolific characters in that crowd. Considering that there's seems to be a surprise at any corner of this online casino game, you would definitely get the same experience on Champion's Goal as you would when standing up close to the edge, and listening to the deafening sound of the cheers when your favourite team strikes a goal. Please play responsibly - for more information visit www.begambleaware.org. Slots Baby is operated by Jumpman Gaming Limited which is licensed by the UK Gambling Commission ('UKGC') for customers in Great Britain and the Alderney Gambling Control Commission ('AGCC') for customers outside of Great Britain. All games on Slots Baby are regulated by the UKGC or both the UKGC and AGCC. Registered business address (no correspondence): Inchalla, Le Val, GY9 3UL, Alderney.